How crazy is it that Thanksgiving is next week? As we mentally prep for the day (cause family), we are also collecting some healthy recipes to make sure that we get our greens amongst a day that is know for gluttony. Whether you are hosting Thanksgiving on your own (wow!) or are just showing up a as a guest, having healthy options is a great way to balance this meal and even have, dare we say it, a healthy Thanksgiving!? 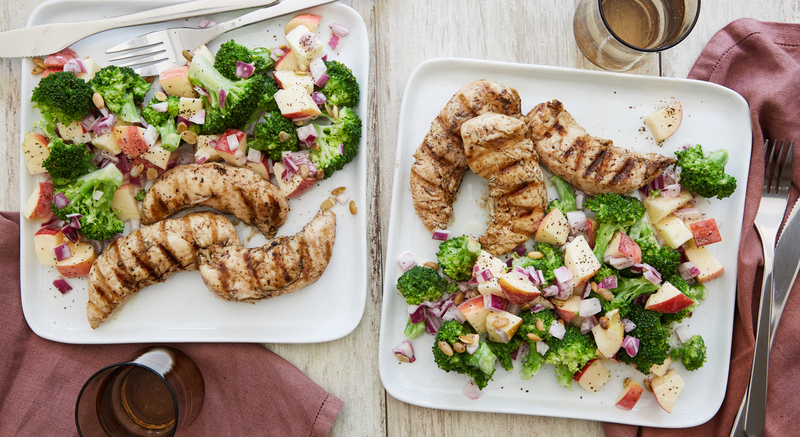 To help us out we are sharing some delicious recipes from our friends at Terra’s Kitchen, a healthy meal delivery service that are sure to inspire your Thanksgiving Day side action. To make, preheat your oven to 375° F.
Line a baking sheet with foil (this really helps with cleanup). 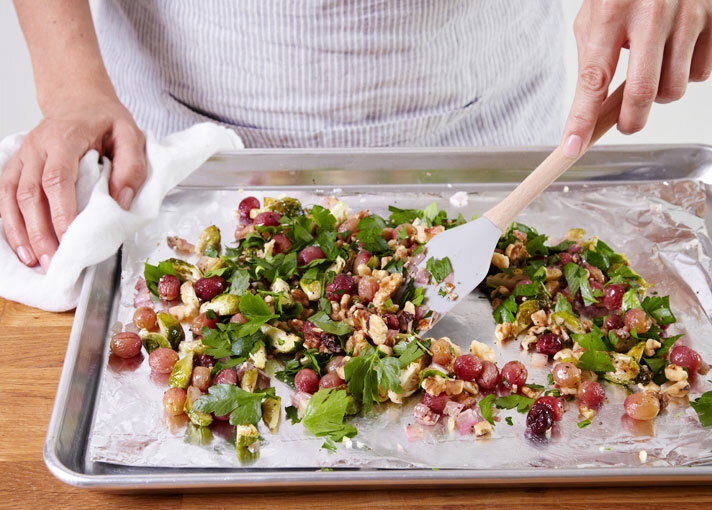 On the baking sheet, toss the Brussels sprouts (7 ounces) and grapes (7.5 ounces) with 1 tablespoon olive oil, 2 cloves garlic, 3 tablespoons shallot, 1 teaspoon salt and ½ teaspoon pepper. Spread evenly and roast until sprouts are tender and golden brown (about 20 minutes). To make, heat 1 tablespoon olive oil and 1 teaspoon garlic in a small nonstick skillet over medium-high heat. 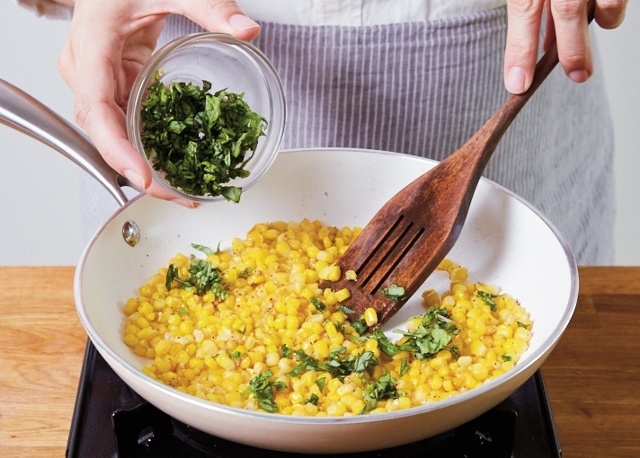 Add 1 more teaspoon garlic, corn (as much as you’d prefer), and ¼ teaspoon each salt and pepper. Sauté 5 minutes or until corn is tender. Stir in basil (add to your liking). Roughly chop your bacon (as much as you prefer) and add to a large skillet over medium high heat. Cook until crisp. Turn off heat. Using a slotted spoon, transfer cooked bacon to the paper towel lined plate. Place skillet back over a low heat. 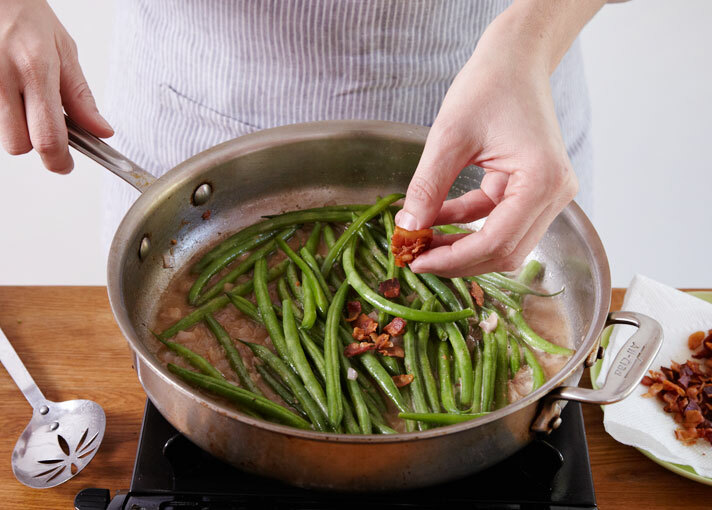 Stir 2 tablespoons shallot into bacon renderings and cook, stirring until translucent (2 minutes). Whisk in 2 tablespoons mustard, 2 tablespoons vinegar, 2 tablespoons sugar and 1/3 cup water. To make, bring a medium saucepan of salted water to a boil. Add broccoli (7 ounces). Cook 3 minutes or until crisp-tender. Drain broccoli, and plunge in a large bowl of ice water to stop cooking. Pat the broccoli dry with paper towels. Chop the apples (5.5 ounces). Make vinaigrette: Whisk together 2 tablespoons mayonnaise, 1 tablespoon vinegar, 1 tablespoon honey, 2 teaspoons extra-virgin olive oil, and ¼ teaspoon each salt and pepper in a small bowl. Enjoy and happy healthy Thanksgiving!